My Geeky Geeky Ways: The Flash Episode Guide: Season 1, Episode 19 - Who Is Harrison Wells? The Flash Episode Guide: Season 1, Episode 19 - Who Is Harrison Wells? As Joe and Cisco journey to Starling City to look for more information on Harrison Wells' past, Barry must contend with a shape-shifting metahuman back home in Central City. Most of the crowd Barry runs into as The Flash while chasing after Everyman the first time seems remarkably unperturbed about a costumed superhero in their midst. How did Laurel find out Barry Allen is The Flash? It's not a secret Team Arrow was likely to let slip and The Flash's presence in Starling City when he visited was low key enough it's unlikely she would have heard about it and put two and two together. 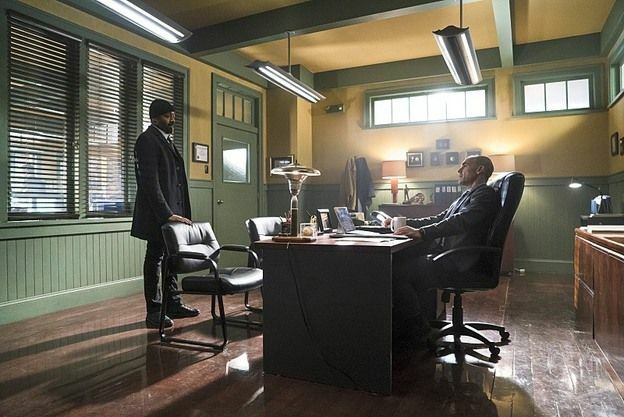 The scenes between Paul Blackthorne and Jesse L. Martin are pure magic and both actors play off of one another well. Daniele Panabaker gets some of her best moments ever in this episode. She has the dramatic conflict of her loyalty to Wells vs. her belief in Barry Allen's essential goodness and righteousness. Her motivations in doubting Barry are rooted in selfishness yet completely understandable. And then there's the comic scenes later where she deals with Everyman disguised as Barry Allen and the momentary guilt of thinking Barry just made a move on her before Iris walked into the building. For that matter, Grant Gustin clearly has a lot of fun playing Everyman in the same scene, having no idea what the relationships between Barry and Caitlin or Barry and Iris are and playing his hand quite badly. Surprisingly, Tom Cavanagh doesn't have much screen time this episode given that Harrison Wells' name is in the title. But the last ten minutes and his discussion with Joe about their dead wives... you still ALMOST believe him even though we now know that "Harrison Wells" is a lying scumbag. The scenes of Harrison Wells walking around his home to light music are well-shot and the music is very well chosen for the scene. We see a billboard for Ferris Airlines as Barry runs to Coast City in the opening scene. Coast City is the home town of Hal Jordan a.k.a. The Green Lantern and he was employed as a pilot at Ferris Aircraft in the comics. In the comics, Hannibal Bates was given superpowers by Lex Luthor and joined the new Infinity Inc. company Lex Luthor sponsored as part of his efforts to sell metagene activation therapy for a price. Given the name Everyman, Bates had the power to shape-shift into the form of anyone whose genetic material he had consumed. He usually ate hair or nail-clippings but built up a taste for human flesh. He became an honest to goodness supervillain for a time, contesting most frequently with Green Arrow. He was eventually killed by the Green Arrow villain Cupid. The DCTVU version of Everyman seems to have similar powers to his comic book counterpart, save that he merely has to touch a person to be able to copy their appearance. Hannibal Bates was named in honor of the fictional killers Hannibal Lectre and Norman Bates. The former was a cannibal and the later dressed like his mother when killing people. On Arrow, Hannibal Bates was one of the names on Oliver Queen's list of people involved in The Undertaking. Wells theorizes early on that Everyman may have the power to absorb superpowers or memories from the people he touches. This turns out to not be the case. The District Attorney of Central City is a woman named Cecile. This may be a reference to Cecile Horton née O'Malley - a defense attorney who represented The Flash when he was put on trial for the murder of The Reverse Flash in the comics. Another 52 reference - the camera on the squad car that recorded Everyman, disguised as Eddie Thawne, shooting two police officers is Cam 52. Cisco modifies one of Sara Lance's sonic devices for Laurel Lance. Not only does he make the decide more powerful but he fits it onto a choker-style necklace. This is a reference to the classic Black Canary costume, which featured a prominent choker. Cisco's name for the new device - The Canary Cry - is a reference Black Canary's famous sonic scream power in the comics. Dr. Wells notes that programmable matter was only theoretical until Everyman's shape-shifting proved it possible. Cisco's "metal detector" actually detects abnormal sound waves and tachyons. Barry conducts a GSR (Gun Shot Residue) swab which proves Eddie's hands are free of lead, barium and antimony. In other words, it would not be possible for him to have fired a gun recently despite what the video-taped evidence shows. Caitlin theorizes she can create a serum that will stop Everyman from morphing by terminating the polymerization reaction, essentially forcing the bonds to revert to their original form. Cisco was able to bump up the specs on Sara Lance's original sonic device, quadrupling the range and tripling the resonance. He also fit the device onto a choker-style necklace. Hannibal Bates cells' have the ability to transmogrify at a rapid rate. Caitlin's serum operates by creating a cortical reaction around Everyman's cells, depriving them of their electrical charge. Barry (opening voice-over) I'm getting faster. Faster than I've ever been and I wonder if it's because lately something's chasing me. I know what it is that's stalking me. It's my past. It's getting closer and as fast as I am I can't help but feel like my past has almost caught up with me. Eddie: No priors. No arrests. Not even a speeding ticket. And everyone who knows this woman - co-workers, neighbors - say she's the kindest, nicest most honest woman they've ever met. Eddie: ...maybe we should be looking for a metahuman? Eddie: One that can control people's minds. Coerce them into becoming thieves. Is that possible? Barry: Is that a real question? Caitlin: Wha- are you spying on me now? Barry: Caitlin, what were you doing at Wells house? Caitlin: I was going to talk to him and get some answers of my own. Barry: You can't! You can NOT talk to him! Caitlin: Oh, so I'm just supposed to stand by and watch all of you ruin this man's life? Or my life?! Barry: What are you talking about "your life"? Caitlin: Those nine months that you were in a coma were the worst of my life! I lost my reputation, my fiancee. And through all of that Harrison Wells stood by my side. He told me everything was going to be okay. If Dr. Wells is who you says he is, everything I've done since the minute I set foot in STAR Labs has been a lie. Barry: Caitlin... if I am right about all of this and you tell him what's been going on, I'll never be able to get my dad out of prison. Barry: If not for me, just do it for him. Caitlin: (sniffling) I can't believe you're pulling the dad card. That's dirty pool, Barry. Barry: Just until Joe and Cisco get back... please? Eddie: No! I run now, that surveillance video is the least of my problems. No way I don't smell guilty. No way they'll let me stay on the force. Barry: Look, you said it yourself. If we don't find Hannibal Bates, you'll go to prison for a crime you didn't commit. I won't let that happen! Not again! Eddie: This isn't like your dad, Barry. Eddie: When your dad was put away, you were a kid. There wasn't anything you could do. But you're not a kid anymore. You're a scientist. Hell, you're The Flash. You are going to find Bates. And you are going to clear me. So go do it. Cisco: Please tell me that's not what I think it is. Quentin: Okay, that is definitely a hand. Cisco: Okay, see, I thought that was a foot, but a hand is just as bad. The exposition in the scene at Joe's house with the pizza is incredibly clunky. Coast City reportedly has the best pizza on the western coast of the USA in the DCTVU. At this point Joe and Barry have been investigating Harrison Wells for six months. Harrison Wells lived in Starling City when his wife died. When explaining Cisco's absence, Caitlin says he's helping his brother Dante, whom we met in 116. Quentin Lance asks Joe about Barry's health following the lightning strike. Quentin and Barry met back in A208. Laurel Lance refers to having met Barry back in A308. Laurel Lance reveals her secret identity to Cisco and asks him to modify one of the sonic devices Sara Lance used as The Canary. Quentin Lance's coffee levitates out of his cup once he is in the immediate presence of what turns out to be Harrison Wells' body, just like the chemicals in Barry's lab levitated out of their beakers right before he got struck by lightning in The Pilot. This is one of the rare occasions Caitlin, not Cisco, names a villain. Joe persuades Quentin not to report the dead body they found together. In her research, Iris discovers six crimes over eleven months committed by people who had air-tight alibis but were still caught on video committing crimes. Barry Allen and Eddie Thawne are both right-handed. Everyman is left-handed. Iris realizes Everyman is an imposter based on this fact. Cisco's payment for creating The Canary Cry? A picture of himself with Black Canary, in her full costume, which Laurel instructs him never to show to anyone on pain of death. Cisco later confirms the body they found is that of Harrison Wells through two separate DNA tests. When Laurel asks how he got The Canary Cry made so quickly, Cisco says he's gotten some experience working with sonic devices recently. He's referring to his work with the Pied Piper technology, which began back in 112. The DA of Central City is now aware of the existence of metahumans as is Captain Singh. Eddie tells Iris the reason he's been so distant lately is that he has been working with The Flash in secret. Everyman has no memory of what he originally looked like. Barry quotes Dr. Tina McGee's comments about Harrison Wells becoming a completely different man following his wife's death in 118. Cisco made a 3D Model of the STAR Labs building to try and figure out what went wrong with the particle accelerator. Examining the whole model allows him, Caitlin and Barry to find Wells secret room, where they see the Reverse Flash costume. The Tachyon device and the newspaper from the future showing Barry Allen's disappearance. The idea that Everyman might be more than just a shapeshifter keeps Barry from just running up to him and grabbing him early on. There's no reason for their final fight to take as long as it does, other than to give the visual effects team a chance to show off by letting Everyman keep changing faces during the fight. A rare treat this. For once the villain-of-the-week subplot doesn't feel tacked on. Indeed, the best bits of acting in this episode center around it and there's a farcical element to Everyman's invasion of STAR Labs disguised as Barry Allen. There's also a rare logical reason why Barry's speed can't be used to defeat this week's guest villain quickly (No Pun Intended) despite the relative lack of strength in their power levels. The bits with Joe West and Quentin Lance are pure fan-service but they're well-acted by Jesse L. Martin and Paul Blackthorne. The bits with Laurel and Cisco aren't bad but they clearly exist only because they needed to justify Laurel getting Black Canary's signature power in a hurry somehow. Oddly enough there's very little of the titular Mr. Wells. Well, up until the last ten minutes and the biggest cliffhanger ever.